Silver Softball / Baseball Mom Earings with Fish Hook - Softball & Baseball Jewelry, etc. These very nice Silver-Plated Fishhook wire Ear Rings feature a stylish features "Mom" with a Baseball / Softball forming the 'O'. 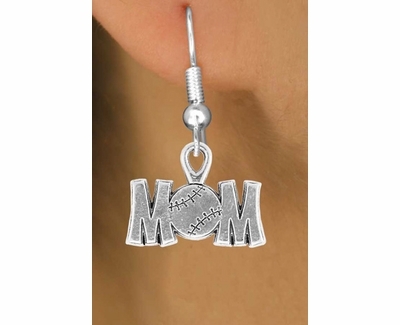 These Baseball Mom earrings make a perfect gift for any Baseball / Softball Player's Mother. Softball / Baseball Mom Earring pendant measures 3/4" high x 7/8" wide - with Surgical Steel Fishhook.